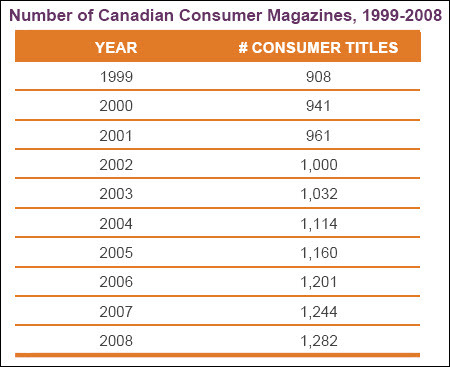 A well-researched Canadian magazine industry profile from the Ontario Media Development Corporation. The Alliance for Audited Media (AAM) provides access to some of its data to non-members (actually, I’ll be damned if I can find any freely-available data). 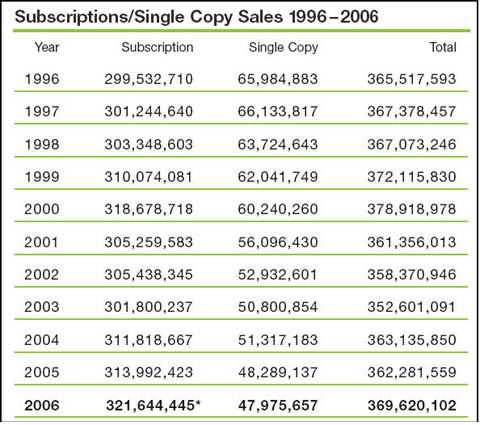 U.K. magazine circulation data here. pwc’s Perspectives from the Global Entertainment and Media Outlook 2017–2021 (pdf) is worth a look. The New York Times has a pretty good look at the magazine business circa fall 2017. Last updated: September 21, 2015, corrections August 27, 2017. 1. Advertising revenue (much more than circulation revenue) seals the fate of most consumer magazines — the shift of ad dollars to the web is perhaps the biggest problem facing broad-circulation magazines today. 2. Few magazine publishers can withstand the loss of ad revenue if they discontinued their print versions. While they are becoming increasingly adept at generating revenue from their web sites, web-only publishing models rarely supplant a print and web model. Digital editions are gaining traction on media tablets, but remain a fraction of the magazine’s circulation base. 3. At the same time, much of the value from magazines — for example, timely, directed editorial — is moving to web media, including blogs and special-interest sites. Can magazine publishing survive the competition? 4. While not as severely challenged as newspapers, magazines in North America are clearly on the Internet hit list. For many periodicals, the long-term prognosis looks grim. Business-to-business magazines are falling first. The future of consumer magazines is still up in the air. The title of this piece could be “The Elevator Pitch for the Future of Periodicals,” as there are a range of periodicals that cannot be defined as “magazines.” Let’s explore the range of published periodicals. Reviewing a dozen charts defining the varying types of published periodicals I find that most adhere to similar explanations. All of them omit “Literary Journals/Magazines,” which are a decidedly separate category from “Scholarly Journals,” (and God knows that, by circulation alone, they could never be called “popular”). In part because I’m on the editorial board of the literary magazine Geist I think the category merits consideration on its own (see Small and Literary Magazines/Journals, below). Daily and weekly newspapers are a decidedly different form of periodical publishing than magazines and journals and so I cover them in a separate section, The Future of Newspapers. Let’s just call it as it is: you publish for love, for money or for prestige. The idea of publishing for love and money is at best misguided, at worst, a quick road to the poor-house. Prestige is like a magic potion that imbues all forms of publishing with stature: the appearance of your letter to the editor of the Podunk Press will stir an unexpected sense of pride. When it comes to publication in scholarly journals, academic and scientific careers are often at stake. Most popular magazines (generally called “consumer magazines”) publish with the profit motive paramount. They may make the usual claim of freedom of expression as essential to the functioning of democracy, but fall mute when the black ink turns to red. A periodical category that can loosely defined as “journals of opinion,” often include a social or political agenda that attracts funding that supplements modest advertsinig and circulation revenue. The deficit at The National Review is covered in part by wealthy conservative donors. Magazines like The New Republic and the U.K. The Statesman are owned by millionaire businessmen. Question: how much to charge for a yearly subscription to a consumer magazine? Answer: as little as possible. The lower the subscription cost, the higher (at least in theory) the number of subscribers. That’s why we still see improbably low offers for magazine subscriptions. A recent issue of Harper’s magazine was more than pleased to offer me 84% off the cover price on a one-year subscription. With most of its revenue derived from advertising, the traditional task of the average consumer or trade magazine is to deliver eyeballs to ads. The only metric for success in this endeavor was to deliver the most eyeballs possible (aka “large circulation”). Circulation revenue for the average consumer magazine has been, with few exceptions, a breakeven proposition (or modestly profitable). Trade magazines derive very little of their revenue from circulation, as the bulk of their subscribers are “qualified,” i.e. in the target group for the advertisers in the publication, and receive the publication for free. The second most common impediment for most periodicals (and indeed for many other publishing media) is the cost of distribution. While newspapers usually employ paid contractors to handle the physical distribution of the paper in their immediate urban market, magazines rely heavily on postal services, and there are never-ending battles between magazine publishers and the post office about how large the postal subsidy should be. Magazines make passionate arguments about literacy and an informed public; post offices demonstrate how much money they lose providing this heavily-subsidized distribution service. With the future of the U.S. Postal Service (USPS) continually in question, magazine voices are somewhat muted. But the issue is always on the front burner for consumer and trade magazines. In Canada the Canada Post reported that “Canadians mailed almost one billion fewer pieces of domestic Lettermail in 2012 than they did in 2006.” The future of the magazine industry and of national postal services are closely intertwined. Few trade organizations (and not only those serving the publishing business) can be counted on as reliable sources of statistics regarding their own industries. They serve to protect, mostly reinforcing a positive viewpoint for their members and business partners. The statistics they release rarely paint a gloomy picture. If a short-term trend appears ominous, other statistics are found that point to a brighter future. The outlook almost always appears positive. So there are two opposing perspectives that can easily be formed about association data: it is skewed and of dubious value, or, it is accurate and the naysayers are wrong. As an analyst I take a middle ground: there is significant value in association data; even greater value when it can be corroborated against third-party sources. The magazine industry is extremely well-organized in its data collection and presentation. While it does release the occasional gloomy report, its data presentation tends to paint a positive outlook for the magazine industry. I’m not a naysayer of the present or future value of magazines. I read many of them with great pleasure, and hope to continue to do so for a long time to come. But my task here is to look closely at all of the published data, and let the conclusions fall where they may. 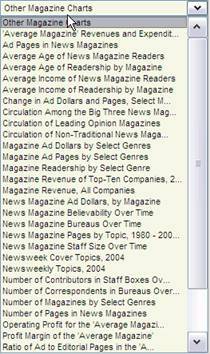 Data collection for the U.S. magazine industry is derived from four related sources: the Magazine Publishers of America (MPA) (now MPA: The Association of Magazine Media) and its affiliates: the Publishers Information Bureau (PIB), the American Society of Magazine Editors (ASME) and the Independent Magazine Group (MPA-IMAG). 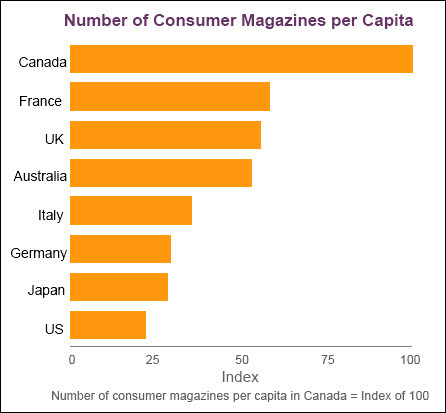 The Canadian industry is covered mainly by Magazines Canada. There are also two trade magazines heavily (or exclusively) focused on magazines: Folio Magazine and Ad Age. Canada, in turn, is covered by Masthead and Marketing Magazine (although it goes beyond magazines as “Canada’s definitive source for news, analysis and insights into the business of marketing”). It is also supplemented by “519130: Internet Publishing and Broadcasting and Web Search Portals.” This covers all periodicals focused “exclusively on the Internet,” and, also search sites, but uncovers a mere 5,697 firms and 6,887 establishments in the 2012 data (xls download). As the government data is clearly understated, the industry-generated data becomes more compelling by comparison. 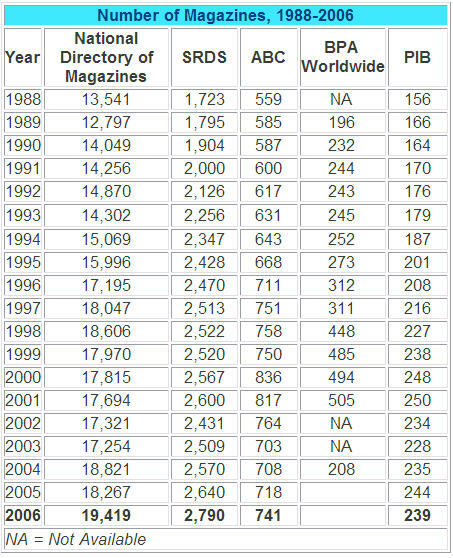 A subset, it’s Standard Periodical Directory, currently in its 36th, 2013, edition, includes 16,867 magazines, 14,163 journals, 12,378 newspapers (and 14,100 newsletters). As the Magazine Publishers of America (MPA) has pointed out the (this link is no longer available online) “there are several sources that provide the number of magazines available in the U.S., some more comprehensive than others. The following chart cites five of these sources: the National Directory of Magazines, Standard Rate and Data Service, Audit Bureau of Circulations, BPA Worldwide, and the Publishers Information Bureau.” The data below is unusually frank for a national organization that has subsequently locked most of its data away exclusively for members. Q: Why do magazines have all those little cards that fall on the floor when you open them? — From Ask Dr. Science: He Knows More Than You Do! Unlike most other forms of publishing (including music and film), advertising-supported periodicals are not always thrilled when unit sales expand. The reason is simple: revenue for the actual sale of the product is covered primarily by ad revenue, and magazines can reach a point where even moderately improved ad revenue can’t cover the cost of increased money-losing circulation. Newsstand circulation is hugely unprofitable (because of distribution costs and the large return rates), and serve mainly to bolster new subscriptions. A vicious circle! Only in the periodical industry would you find a trade magazine headlining a 2008 article “Why Consumer Magazine Circulation Levels are Still Bloated.” I can’t imagine Publishers Weekly, “the bible of the book business,” running an article titled “Book Sales are Still Bloated”! Staying with industry-reported figures, according to the “The Magazine Handbook,” publishing by the Magazine Publishers of America (now behind a paywall), magazine circulation is doing just fine, albeit not much increased from late 1990s levels. 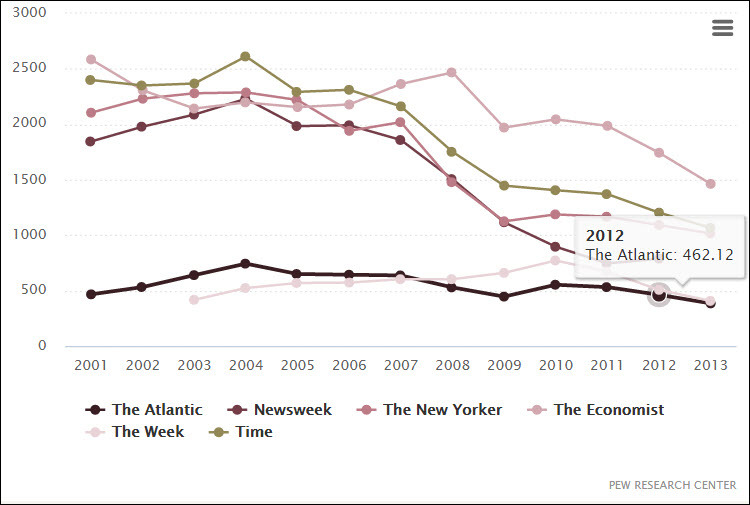 Newsstand sales have decreased, but this has been offset by subscription sales. The CLMP makes the not surprising statement that “the number of literary magazines is a difficult one to pin down. A literary magazine may be a very ephemeral thing, publishing only once or twice, printing a handful of copies, and fading away before coming to the notice of any of the organizations, indexes, or directories that try to keep up with this world. Over in Wisconsin, the University of Wisconsin, Madison features “the Little Magazines Collection with runs of more than 7,000 experimental English-language literary magazines (ca. 1900-the present),” including “the collection currently maintains about 1,200 ‘live’ subscriptions,” albeit not just from U.S. publishers. Clearly these publications fall outside of many of the same economics and market forces of commercial and trade publications. Whether this means they have a brighter future as a result doesn’t appear to me to be a logical corollary. There is another angle on circulation data, and it’s provided by Ulrich’s. By this company’s description, “Ulrich’s is the authoritative source of bibliographic and publisher information on more than 300,00 periodicals of all types.” The Web site is now more comprehensive than the print edition. The Publishing Statistics page at the University of Texas Libraries informs that “in the 36th edition of Ulrich’s Directory of Periodicals, 9,586 titles had ceased or suspended.” That represents some 5% of the “regularly and irregularly issued serials” classified by Ulrich’s. Can we state that periodical publishing is in a constant state of churn? 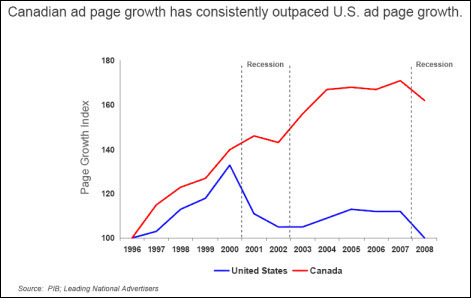 Advertising in Canadian magazines is also substantially stronger than in the U.S., based on latest industry Magazines Canada figures. “The marginal profit on advertising is very high, whereas the marginal profit from the publishing product is extremely low. For every additional dollar of advertising, there are relatively low direct or incremental costs. Ad commissions might be 15 percent, and there are additional printing and postage costs, and perhaps some editorial costs if a constant ad:edit ratio is being maintained. But, in general, the incremental costs of advertising are extremely low. If ad costs average 20 percent of revenue for a publication, the mark-up could be described as 500 percent. The State of the News Media 2015, News Magazines, provides a plethora of additional statistics. I’m still trying to find a chart that illustrates clearly where all of these numbers fall. But many of the efforts have been half-hearted. The most-common publishing method used by magazines for their websites still involves taking a shovel and loading the words onto one or more pages. 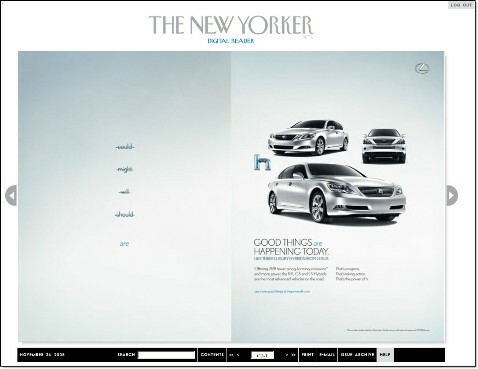 Rather than trying to increase the value of their editorial content, most of their effort is directed towards trying to get more advertising crammed onto the same pages no matter how offensive it is in terms of appearance and its ability to interrupt the reader in his or her task of simply trying to read the article in front of them. 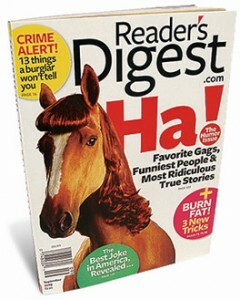 Some magazines are still coy about their Internet presence. Harper’s Magazine for years steadfastly refused to offer anything more than its famous Harper’s Index on the Internet (this has changed in recent times with much more content available to visitors). The New Yorker, on the other hand, after several years as a wallflower at the Web publishing party, now offers about a third of its new content each week on the Web. The choice of what gets offered continues to mystify the layman. I find that some weeks the only article that would move me to purchase the publication is available for free on the Web while other weeks it seems like every article but the interesting one(s) can be found on the Website. To its credit, The New Yorker makes a consistent effort to allow open access to their extremely well researched and well-written articles concerning current US politics, as well as a great many archival articles and reviews. 1. The HTML version missed some or all of the graphics of the print version. 2. The posting of the HTML version was often delayed, particularly by smaller publications (mainly because of a shortage of manpower and suitable technology). 3. Many publications were reluctant to offer current issues to non-subscribers. Stage two in the progress to the electronic publication of print magazines (and to some extent crossing over with stage one) was to offer for download PDF versions of the actual files that were sent to the printer. This had some success, but in many cases publishers were concerned because it lacked any form of rights management, and in many cases proved difficult to build an additional revenue stream around the offering. Starting about the year 2000 we saw the emergence of dedicated digital magazine formats. I don’t know exactly who got there first. But a March, 2001 article from paidContent.org (no longer available online) written by Tom Watson and Jason Chervokas was titled “Waiting for the Printless Magazine? Don’t Hold Your Breath.” It reflected a lot of my thinking at the time, akin to my views of eBooks: what exactly was the benefit to be derived by offering a new electronic format for magazines when current technology was doing the job just fine? In May of 2008 The Gilbane Group made available for download a multi-client study called “Digital Magazine and Newspaper Editions: Growth, Trends, and Best Practices,” co-written by noted Gilbane analysts (and colleagues of mine) Steve Paxhia and Bill Rosenblatt. The well-researched data and numerous case studies make it plain that this is not some flash-in-the-pan phenomena, but a fast-growing aspect of both B-B and B-C magazine publishing today. Highly recommended reading, and at 135 pages, impossible to summarize here. I now was convinced that my early call was wrong. I had the (slight chilly) comfort of the awareness that one learns so much more from being wrong than from being right! The other player, Zinio, is reputedly up for sale, but hasn’t found a buyer. At the date of this post they’re hiring for 4 positions, so all is not lost. Founded in March, 2000, Zinio claimed last year to be “the recognized leader in digital publishing and marketing services. Why? Because we understand publishing, we know how to create new market and revenue opportunities for publishers and we give consumers more choice, convenience and accessibility than anyone else. Why Are Digital Magazine Formats Thriving? What has struck me as the overriding reason to subscribe to a digital magazine is timeliness. The challenge is not so pronounced in North America, but if you subscribe to an important journal and reside overseas, it can be important to your career to find the contents of the latest issue immediately online rather than waiting for the long trek of postal third-class (or whatever it’s called today) publications to reach your home in Europe or Asia. “The ability to save and easily reference past issues” is generally available to most, if not all subscribers. “Environmental awareness,” is becoming a concern for many readers. But timeliness: there’s no substitute. From the publisher’s perspective there’s an undeniable advantage: ads appear with great fidelity as they would in the print edition, and the official circulation counters have now agreed to include these digital editions in circulation totals. If nothing else, the print ads are preserved. As with all matters pertaining to the future of publishing, a grim prognosis can only be viewed through today’s lens. This article makes clear that the financial numbers are short of disastrous (and much influenced by the overall economic downturn) and also that magazines are constantly bestirring themselves to seek innovative solutions to their current dilemma. It is not my plan to be reading magazines exclusively in digital formats in the years ahead. Nor is it my plan to invest in their operations during the same period. (i) Industry veteran Bob Sacks, aka BoSacks, has a very Bob Sacks type of website and offers there a free subscription to his thrice a day newsletter which captures key articles on the publishing industry from diverse sources. (ii) Samir Husni, aka “Mr. Magazine” is a real treasure for the magazine industry: He’s the founder and director of the Magazine Innovation Center at the University of Mississippi’s Meek School of Journalism and New Media. He’s truly tireless in his investigation and promotion of all aspects of magazine publishing. Mr. Magazine has an excellent blog. His interviews are in-depth and a fantastic resource for industry insiders. Husni’s Launch Monitor tracks new magazines launched in the U.S., month by month. (iii) Adweek offers newsletters across a range of topics. (iv) The best Canadian magazine blog I know of is called “Canadian Magazines,” offering “News, views and reviews of the Canadian magazine industry.” It’s thorough and insightful, whether you’re interested in just the Canadian market or have international concerns. There are numerous others which you’ll find linked to at the sites above. 3. The State of the News Media, updated annually, covers publishing as it relates specifically to news. Over the years this has led to some very aggressive tactics from companies associated with magazine publishers to help sell subscriptions. “Two days after graduating from high school last June, Jonathan Pope left his home in Miamisburg, Ohio, to join a traveling magazine sales crew, thinking he would get to “talk to people, party at night and see the country. 6. InPublishing “serves the UK newspaper, magazine and online publishing community, through its bi-monthly magazine, weekly email newsletter and website.” In some respects the U.K. publishing milieu is different than U.S. and Canada. In many other ways it’s similar or equivalent.